Maple trees are best known for their maple syrup and lovely fall foliage. But it turns out that the beauty of those leaves could be skin-deep -- and that's a good thing. Today, scientists report that an extract from the leaves may prevent wrinkles. The researchers are presenting their results at the 256th National Meeting & Exposition of the American Chemical Society (ACS). ACS, the world's largest scientific society, is holding the meeting here through Thursday. It features more than 10,000 presentations on a wide range of science topics. The scientists had previously studied the chemistry and health benefits of sap and syrup obtained from sugar maple and red maple trees. Historical records suggested that other parts of the trees could also be useful, according to Navindra P. Seeram, Ph.D., the project's principal investigator. "Native Americans used leaves from red maple trees in their traditional system of medicine," he notes, "so why should we ignore the leaves?" Skin elasticity is maintained by proteins such as elastin. Wrinkles form when the enzyme elastase breaks down elastin in the skin as part of the aging process. "We wanted to see whether leaf extracts from red maple trees could block the activity of elastase," says Hang Ma, Ph.D., who is presenting the work at the meeting and is a research associate in Seeram's lab. The researchers, who are at the University of Rhode Island, zeroed in on phenolic compounds in the leaves known as glucitol-core-containing gallotannins (GCGs) and examined each compound's ability to inhibit elastase activity in a test tube. The scientists also conducted computational studies to examine how the GCGs interact with elastase to block its activity, and how the molecules' structures affect that blocking ability. GCGs containing multiple galloyl groups (a type of phenolic group) were more effective than those with a single galloyl group. But these compounds can do more than interfere with elastase. In prior work, Seeram's group showed that these same GCGs might be able to protect skin from inflammation and lighten dark spots, such as unwanted freckles or age spots. Seeram and Ma plan to do further testing. "You could imagine that these extracts might tighten up human skin like a plant-based Botox®, though they would be a topical application, not an injected toxin," Seeram says. And the fact that the extracts are derived from trees would be appreciated by consumers who are looking for natural, plant-based ingredients in their skincare products. 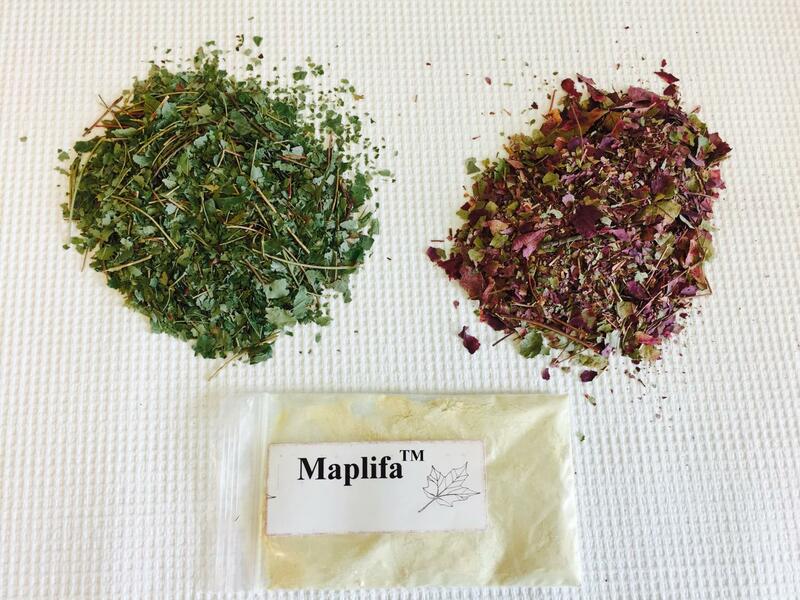 The researchers have taken steps to get the extracts into products, having developed a proprietary patent-pending formulation containing GCGs from summer and fall maple leaves and maple sap, which they named MaplifaTM (pronounced "mape-LEAF-uh" to reflect its origin). They have licensed it to botanical extracts supplier Verdure Sciences based in Indiana and are hoping to eventually find a market for the formulation in the cosmetics sector or even in dietary supplements. If these products come to fruition, the team's findings could benefit the local economy. "Many botanical ingredients traditionally come from China, India and the Mediterranean, but the sugar maple and the red maple only grow in eastern North America," Seeram says. Farmers in the region, who currently only harvest sap from the maple trees, could tap the leaves as a value-added product for an additional source of income. Even better, the process would be sustainable because leaves could be collected during normal pruning or when they fall from the trees in autumn. Skin wrinkling is a declining process of skin cell function associated with aging caused by the loss of skin elasticity over time. Skin elasticity is maintained by skin extracellular matrix proteins such as elastin. Elastase, a member of the chymotrypsin family of proteases, is responsible for the breakdown of skin elastin. Therefore, inhibition of elastase enzyme is a plausible management for skin elastin degradation and thus, elastase inhibitors, including natural products, are being investigated as anti-wrinkle cosmetic agents. We previously reported on the skin protective effects, including anti-glycation and anti-melanogenic properties, of a series of glucitol-core containing gallotannins (GCGs) from a proprietary phenolic-enriched red maple (Acer rubrum) leaves extract (MaplifaTM). However, the effect of these GCGs on elastase enzyme is unknown. Herein, we investigated the inhibitory effects of MaplifaTM GCGs including ginnalin B (GB), ginnalin C (GC), ginnalin A (GA), maplexin F (MF) and maplexin J (MJ) on elastase enzyme. The GCGs (at 500 μM) showed inhibitory activities ranging from 21.3 - 62.5% and the GCGs with multiple galloyl group including GA (2 galloyls), MF (3 galloyls), and MJ (4 galloyls) showed superior activity to those GCGs with a mono-galloyl group (namely, GB and GC). The mechanisms of the GCGs' inhibitory effects on elastase enzyme were further studied by using an enzyme kinetic assay and computational docking method. Our data suggest that MaplifaTM GCGs may have anti-wrinkle activity through the inhibition of elastase enzyme warranting further studies on its cosmetic applications. We have now a lot of evidence on genetic components in many disorders including neurological in both adults and kids. Autism is one such problem that has many genes involved. Research is still in full swing to find more genes and related pathways. However, one can find autistic features more phenotypically before genotyping. Eye contact is one of them. Studies have shown that autistic kids make less eye contact. This has been shown to have genetic component now. New research has uncovered compelling evidence that genetics plays a major role in how children look at the world and whether they have a preference for gazing at people's eyes and faces or at objects. The discovery by researchers at Washington University School of Medicine in St. Louis and Emory University School of Medicine in Atlanta adds new detail to understanding the causes of autism spectrum disorder. The results show that the moment-to-moment movements of children's eyes as they seek visual information about their environment are abnormal in autism and under stringent genetic control in all children. Are you suffering from sleep disturbances? Do you have trouble getting sound sleep every day? Do you toss around too much during the night without much sleep? Do you get up every day tired because you didn't get enough sleep? Well, all these seem to be linked to early signs of Alzheimer's. Poor sleep may be a sign that people who are otherwise healthy may be more at risk of developing Alzheimer's disease later in life than people who do not have sleep problems, according to a study published in the July 5, 2017, online issue of Neurology®, the medical journal of the American Academy of Neurology. Researchers have found a link between sleep disturbances and biological markers for Alzheimer's disease found in the spinal fluid. Although much research has examined traumatic brain injury (TBI) as a possible risk factor for later life dementia from neurodegenerative diseases such as Alzheimer's disease (AD), little is known regarding how TBI influences the rate of age-related cognitive change. A new study now shows that history of TBI (with loss of consciousness) does not appear to affect the rate of cognitive change over time for participants with normal cognition or even those with AD dementia. These findings appear in the Journal of Alzheimer's Disease. The study's first author Yorghos Tripodis, PhD, Associate Director of the Data Management and Biostatistics Core of the BU ADC and associate professor of Biostatistics at Boston University School of Public Health, cautioned, "Our findings should still be interpreted cautiously due to the crude and limited assessment of TBI history available through the NACC database." The researchers recommended that future studies should collect information on the number of past TBIs (including mild TBIs, as well as exposure to sub-concussive trauma through contact sports and other activities) along with time since TBI, which may play a significant role in cognitive change. Training your brain for reducing dementia development chances is the new mantra these days. There are so many games and websites now-a-days that boast their abilities in reducing individuals chances of developing memory loss or dementia. Its proven fact that regular reading, gaming and brain teasers help reduce the progress or atleast the speed of development of dementia. Now, researchers at the University of Cambridge have developed a game to train the brain that could help improve the memory of patients in the very earliest stages of dementia. This study has been published in "The International Journal of Neuropsychopharmacology". "Good brain health is as important as good physical health. There's increasing evidence that training the brain can be beneficial for boosting cognition and brain health, but it needs to be based on sound research and developed with patients," says Professor Barbara Sahakian, co-inventor of the game: "It also need to be enjoyable enough to motivate users to keep to their programmes. Our game allowed us to individualise a patient's cognitive training programme and make it fun and enjoyable for them to use." The design of 'Game Show' was based on published research from the Sahakian Laboratory at the University of Cambridge. The study was funded by Janssen Pharmaceuticals and Wellcome. In 2015, Professor Sahakian and colleagues showed that another iPad game developed by her team was effective at improving the memory of patients with schizophrenia, helping them in their daily lives at work and living independently. The University of Cambridge Wizard memory game is available through PEAK via the App Store and Google Play. In the last decade, mounting evidence has linked seizure-like activity in the brain to some of the cognitive decline seen in patients with Alzheimer's disease. Patients with Alzheimer's disease have an increased risk of epilepsy and a nearly half may experience subclinical epileptic activity -- disrupted electrical activity in the brain that doesn't result in a seizure but which can be measured by electroencephalogram (EEG) or other brain scan technology. In a recent feasibility study, clinician-scientists at Beth Israel Deaconess Medical Center (BIDMC) tested an anti-epileptic drug for its potential impact on the brain activity of patients with mild Alzheimer's disease. The team, led by Daniel Z. Press, MD, of the Berenson-Allen Center for Non-invasive Brain Stimulation at BIDMC, documented changes in patients' EEGs that suggest the drug could have a beneficial effect. The research was published in the Journal of Alzheimer's Disease. "In the field of Alzheimer's disease research, there has been a major search for drugs to slow its progression," said Press, an Instructor of Neurology in the Cognitive Neurology Unit at BIDMC and an Associate Professor of Neurology at Harvard Medical School. "If this abnormal electrical activity is leading to more damage, then suppressing it could potentially slow the progression of the disease." In this double-blind within-subject study, a small group of patients with mild Alzheimer's disease visited BIDMC three times. At each visit, patients were given a baseline (EEG) to measure the electrical activity in the brain. Next, patients were given injections containing either inactive placebo or the anti-seizure drug levetiracetam, at either a low dose (2.5 mg/kg) or a higher dose (7.5 mg/kg). Neither patients nor medical professionals knew which injections patients were receiving, but each patient eventually got one of each type, in a random order. After receiving the injection, patients underwent another EEG, then magnetic resonance imaging (MRI) -- which measures blood flow in the brain, another way to quantify brain activity and determine where in the brain it is taking place. Finally, patients took a standardized cognitive test, designed to measure memory, executive functioning, naming, visuospatial ability and semantic function - capabilities all affected by Alzheimer's disease. In the seven patients able to complete the study protocol successfully, Press and colleagues analyzed changes in their EEGs. (Blood flow analysis from the MRI data is still underway.) Overall, higher doses of the anti-seizure drug appeared to normalize abnormalities seen in the patients' EEG profiles. That is, researchers saw overall increases in brain wave frequencies that had been abnormally low in Alzheimer's disease patients prior to receiving the higher dose of levetiracetam, and, likewise, saw decreases in those that had been abnormally high. "It's worth noting, we did not demonstrate any improvementafter a single dose of medication in this study," said Press. "It's too early to use the drug widely, but we're preparing for a larger, longer study." The risk of developing Alzheimer's disease increases sharply with age. Today, it affects more than 5 million Americans, a figure that is projected to reach 16 million by 2050 as the population ages. In recent years, researchers have focused on developing techniques to clear the brain of amyloid and tau protein plaques that build up and wreak havoc in the brains of patients with Alzheimer's disease. "These strategies have not led to new therapies to date," said Press. "There have been a lot of disappointments. So our findings represent an interesting new avenue." Press' co-investigators included co-lead author Christian S. Musaeus and Emiliano Santarnecchi of the Berenson-Allen Center for Non-invasive Brain Stimulation at BIDMC; Mouhsin M. Shafi and Susan T. Herman of the Department of Neurology at BIDMC. This research was supported by a grant from the Fidelity Biosciences Research Initiative and private donations.